When the Westchester County Health Department shut 10 Long Island Sound beaches on July 23, it was the 12th day this summer those beaches had been closed preemptively because of pollution, by our unofficial count. But there are many more than 10 beaches on the Sound in Westchester. In fact, the county Health Department conducts water quality testing at 21 Long Island Sound beaches in the county. So why is swimming banned at 10 beaches but not at the other 11? How can it be that the water is unsafe at those 10 beaches but fine for swimming at all the others? We’ve been asked those questions since Memorial Day, when we began our pilot Sound Swim Alert project for Westchester. The first thing to keep in mind is that the county has been testing the water for decades, so it has the data to show that when it rains, the bacteria rise to unsafe levels at the 10 beaches in question, but do not at the others. The Westchester County Health Department began preemptively shutting beaches in 1985, in Mamaroneck, when it first discovered that stormwater was carrying pathogens from throughout the Mamaroneck River watershed into Mamaroneck Harbor. The watershed extends into White Plains, Harrison, Scarsdale, and Rye as well as Mamaroneck village and town. Testing later showed that bacteria levels at some New Rochelle beaches, and one in Rye, rose after rain storms as well, and they were added to the preemptive closing list. Disease-causing bacteria reach the beaches regularly because sewers throughout Westchester are in disrepair. They are cracked by age and broken by tree roots; whole sections have collapsed upon themselves. That allows stormwater to infiltrate the pipes and force out sewage before it can reach the four sewage treatment plants in Westchester along the Sound. The sewage-laden stormwater then flows into local waterways toward the Sound and its harbors and beaches. Stormwater is also laden with bacteria that it picks up from streets, parking lots, sidewalks and elsewhere. But why does that affect some beaches more than others? The 10 beaches that get shut down preemptively are all in harbors or coves, which prevent tides and currents from quickly washing the bacteria out to the main part of the Sound, where it would be diluted. According to the Health Department, those 10 beaches are also very close to storm sewers and, in the case of the Mamaroneck beaches, to the Mamaroneck River, which serves as a conveyor for bacteria from all those communities in its watershed. Click this interactive map, prepared by the Natural Resources Defense Council as part of its annual “Testing the Waters” report, to see where each of Westchester’s beaches are located. Other Sound beaches are on open water, comparatively. 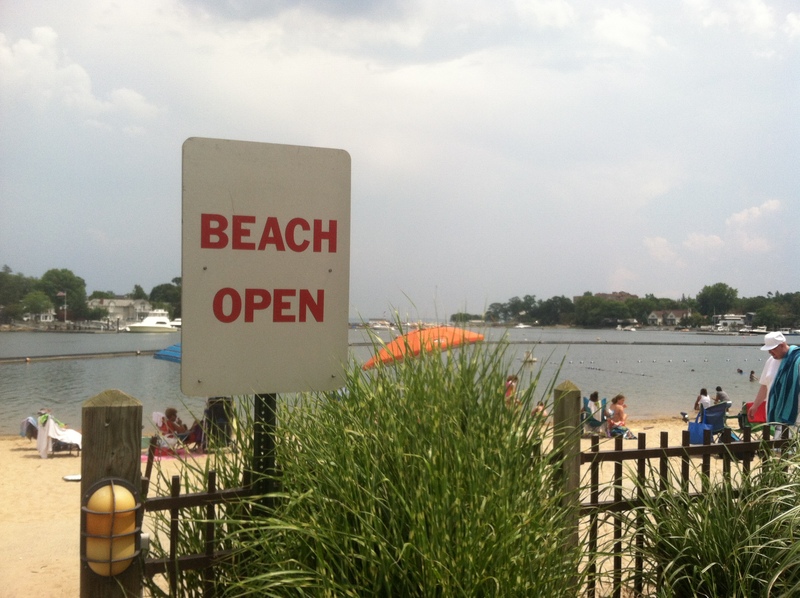 The biggest, busiest beaches in the county – Playland and Rye Town Park, in Rye, and Glen Island in New Rochelle – all open onto the Sound and are farther from storm sewers. If there is a silver lining in this situation, that’s it: the pre-emptive closings affect relatively small beaches; the most popular beaches, by luck of geography, avoid the worst pollution. Still, it’s a silver lining in a dark cloud. Preemptive beach closings have been routine for almost three decades. It was unacceptable in 1985 and it’s more so now. Save the Sound is working hard to call new attention to this problem through our Sound Swim Alerts and by talking directly with local governments. We urge all Westchester residents to contact their local elected officials and let them know that fixing the sewers and cleaning up the beaches should be a priority. Posted by Tom Andersen, NY program and communications coordinator for Save the Sound. The Mamaroneck river really is an ongoing issue. We need a riverkeeper type approach to get it cleaned up. This is really great work by SOS!